You can’t argue with the fact that this may be one of the hottest and most humid summers we’ve had in Boston for quite a while. Though this weekend is supposed to be less humid you should still take advantage of the Boston Common Frog Pond spray pool. I remember going there when I was a kid and they have updated it a lot since then. It is a great place for younger kids who are crawling the walls at home during the hot stretches that have been taking place the last few weeks. It will also save you on air conditioning costs. The best part of course is that this is free. It is currently open and will be open until Labor Day between 11am and 6pm. You can also plan to have lunch there at the Lily Pad Cafe which is relatively new. It definitely wasn’t there when I was a kid. They have also put up a carousel right next to the Boston Frog Pond. The carousel isn’t free but it is pretty reasonable at $3 per ride. 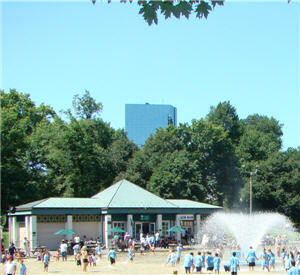 Whether you are native of Boston or visiting as a tourist you will find the Frog Pond well located near downtown Boston so you can make plans before or after your trip to the Wading Pool.